Ultrasonic Transducers : TotallyEnClosed SS Body , Made from Special Piezo Ceramic Rings Which are Specially Design for Transducer for sieving appliction. Ultrasonic generator ; latest Technology Mosfet based Compact with Digital Display Shows Ultrasonic Frequency, Power . 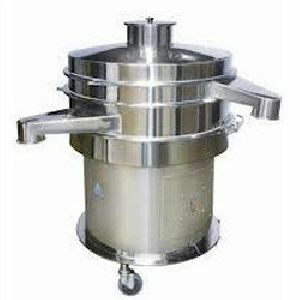 One can vary Ultrasonic Frequency and Ultrasonic Power by Our Special Design Ultrasonic generator. Circular SS ring willbe Provided On Grill, On This Ring, Transducer willbe Mounted. Ultrasonic Power 500 watts Average. Screen Dia. 752 mm. 914 mm. Capacity/Hour * 30 to 300 Kgs. 40 to 400 Kgs. Discharging height 670 mm. 670 mm. Electric Motor 0.5 HP / 1440 RPM / 3 Ph. 1 HP / 1440 RPM / 3 Ph.